Continuing in the vein of our under-appreciated UK & U.S. thrash features, Worship Metal casts its critical eye over 6 under-appreciated classics of German thrash, the only country to truly rival the U.S in the thrash stakes! The sheer number of considerably skilled Teutonic thrashers arriving on the scene in the mid 80’s was astonishing and mounted a serious challenge to America’s dominance. Mixing a furious blend of skin-strippingly raw and bloodied riffs with unhinged, snarling vocals and breakneck speed, Germanic thrash bands had a sound all of their own. 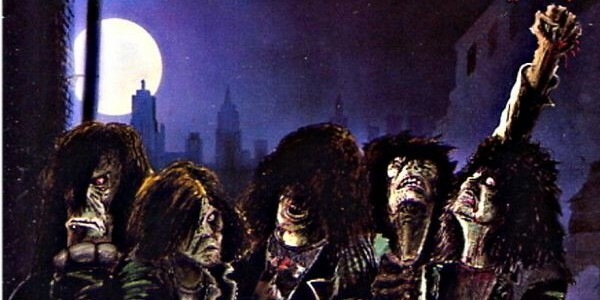 While the Americans were preoccupied with showmanship and lengthy compositions, the Germans concentrated on the most ugly, twisted and animalistic thrash imaginable….resulting in a multitude of quality releases falling by the wayside as Kreator, Destruction, Sodom and Tankard proceeded to steal much of the limelight. Remember, this is just Part 1….there’s more under-appreciated classics of German thrash to come! Severely lacking in anything approaching originality, you’d be forgiven for letting Darkness pass you by, their by-the-numbers thrash attack adhering a little too faithfully to the pioneering sounds already solidified by Sodom, Destruction and Kreator a few years earlier. However, give Darkness a chance to shine (ironically) and you’ll experience a debut album that actually hits pretty damn hard with sustained and tightly controlled rage. Opening ‘oh so gently’ with the delicately strummed “Invasion Sector 12”, it’s the building intensity of a distant air siren and the unnerving sounds of bombs decimating the landscape that truly warns of things to come….with all-out-war eventually declared by these leather-clad thrashers! A bevy of speed-obsessed ragers then follow, careening forth just on the right side of chaos with the likes of “Critical Threshold” and “Staatsfeind” providing the requisite blistering riffs and compulsory head-banging moments. Sharing more commonality with underground acts such as Necronomicon and Assassin, these boys from Essen may have been a mere footnote back in the 80’s but they reformed in 2013, going on to release the damn fine come-back album The Gasoline Solution in 2016. Liked that? Try this: Darkness’ 1989 sophomore effort Defenders Of Justice also has its moments! Huge News From Cult Thrashers Atrophy! Dig out the Beer Bong! Celebrating 30 Years Of Tankard’s Chemical Invasion! Never mind the chemicals....it's a THRASH invasion! Put down your Kreator, Destruction, Sodom & Tankard records.....this is what you should be listening to!